Are you in a hurry to get a job? Are you having a hard time finding a job, and starting to feel discouraged? 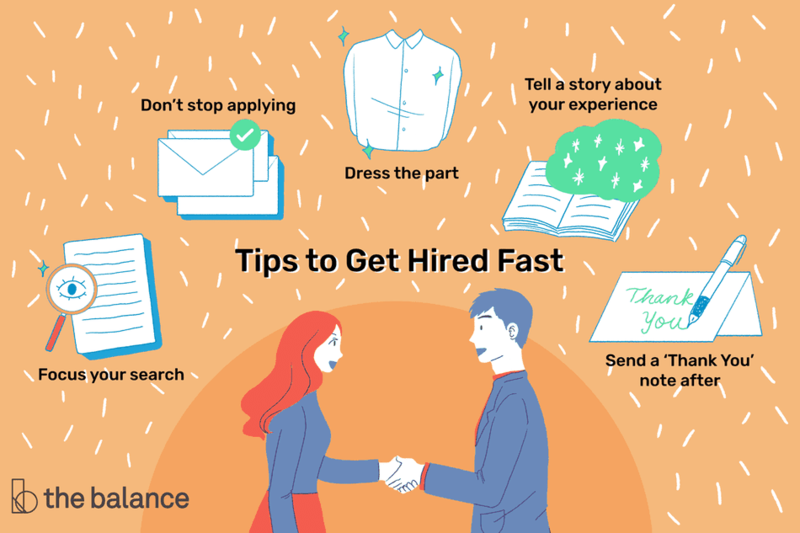 There are some things that don't take a lot of time that can help you get hired quickly. Here are 15 things you should know about job hunting that will help you find a new job fast. Some of the things on the list are little things that make a difference. Others are significant enough that they can make or break your job search. Review the list to see if there's anything that you're not doing and give it a try. 1. You can save time job searching by using advanced search options on job boards. All the major job boards, such as Indeed.com, SimplyHired.com, CareerBuilder, and Monster, have an “Advanced Search” option where you can search by keyword, location, a radius of a location, job title, company, type of job, date posted and other options. Here’s a list of the top 10 best job sites, and tips for using Advanced Job Search options. 2. Applying for every job you find isn’t always a good idea. Focus your search on jobs that you’re qualified for. You’ll have a better chance of getting selected for an interview. Sending out random resumes and cover letters is just going to be a waste of time. Before you start job hunting, take the time to decide what type of job you’re seeking. Even better, come up with a target list of companies you’d like to work for and do your best to get noticed by them. Here’s how to get noticed by your dream company. 3. Don’t stop applying for jobs while you are waiting to hear back from an employer. Most job seekers are rejected by over 15 employers before landing a job. Learn from your mistakes and keep applying until you get the right offer. Worst case scenario, you’ll be juggling multiple job offers. That’s a good thing. 4. You need a specific cover letter, or your resume may not get noticed. You only have a few seconds to impress a hiring manager enough to select you for an interview. Hiring managers want to see what you can do for the company written in the first paragraph of your cover letter. Here’s how to match your qualifications to a job, and tips for how to write a cover letter. 5. You should also target your resume to the job. It’s not just your cover letter. Your resume should be edited and tweaked, so it’s as close a match to the job as possible. Otherwise, it may not get picked up by the applicant tracking systems companies use to screen resumes or the recruiter who reviews it. Here’s how to write a targeted resume. 6. You don’t need to include all your experience on your resume. Some job seekers put decades of work experience on their resumes. Unfortunately, that’s not going to impress anyone. It dates you, it’s too much information, and it may be too much experience for most job openings. Here’s what experience and dates to include on a resume. 7. You can include more than full-time employment on your resume. If you’ve been out of work, you don’t want your resume to look like you haven’t done anything since you were laid-off. There are other things besides your employment history you can use to bolster your resume. Here’s a list of what to include on your resume when you have been out of the workforce. 8. Dress like a manager or a successful person in your profession. Maybe appearances shouldn’t matter so much, but they do. The first few minutes of an interview are when you get to make that critical first impression. Be sure that you’re dressed appropriately for the type of job and company you’re applying to. Here’s appropriate interview attire for a variety of different jobs and work environments. 9. Be yourself at the interview. Rehearsed answers, fake smiles, and saying what you think the interview wants to hear instead of what you actually believe, mislead the employer. Employers want to know who they’re hiring and that’s the person they expect to show up for the first day of work. 11. Never say anything bad about a previous employer. One of the most common interview mistakes is badmouthing your boss or co-workers. The first thing the interviewer is going to think about is what you will say about their company when you’re moving on. 12. You should send a thank-you note after a job interview. It’s important to follow-up after a job interview. It’s a way to show your appreciation for being considered for the job. It’s also a way to reiterate your interest and share anything you neglected during the interview. Here’s how to say thank you for a job interview, along with sample thank you notes and email message. 13. Networking is an essential component of successful job hunting. Most jobs are found through networking, whether it’s online or in-person. You never know who can help you find your next job unless you tell your connections that you’re looking for a job. Here’s how to utilize your contacts at a company. 14. References can make a big difference in getting hired. References are important, and employers check them. Get recommendations from bosses, co-workers, clients, subordinates, and suppliers. Store them on sites like LinkedIn and share them whenever possible. If you’re worried about getting a lousy reference from your supervisor, work on getting some personal references you can add to your credentials. Here’s what to do about bad references. 15. It’s acceptable to apply for the same job more than once. You applied for your dream job, and you didn’t hear anything back from the company. Then later you see the job posted again. A “do over” is fine but be sure that you’ve carefully matched your qualifications to the job requirements in your resumes and cover letters. Also, check LinkedIn to see who you know. You might be able to get a referral the second time around. Here’s how to find contacts at a company. Pay attention to the details. Job hunting can feel like you're playing a multitasking game to try to keep up. There's so much you need to pay attention to when you want to impress a prospective employer. Here are 10 important things not to forget when you're job searching.